Benefits of Crescent Warrior – Stretches the hip flexors and strengthens the legs and arms. Expands the chest, rib cage and heart center. Stengthens the upper back. Improves balance and stability. I have a somewhat crooked spine so twists taken in this pose feel amazing. They stretch the muscles that work hard to stabilize the spine. 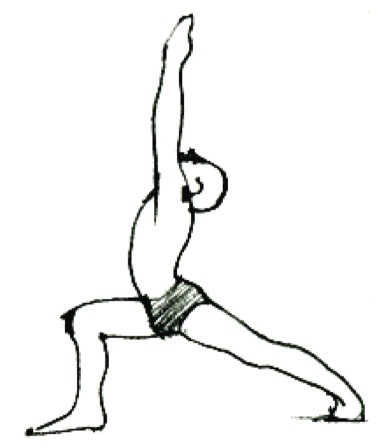 Tip: The biggest challenge I face with this pose is moving into and out of it during flow sequences. The rotation of the back foot has to be smooth. Coming to the ball of the foot before moving helps with stability while changing poses.